Facebook Pages may only be administered by authorized representatives of their subject matter. 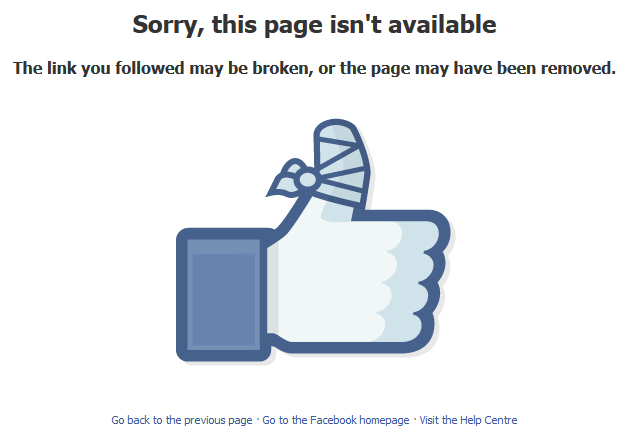 As a result, your Page has been removed for violating our Terms. I then checked Facebook and sure enough – the page is gone. Somewhere over 900 likes, an engaged community of Microserver users, posts and information going back nearly 2 years, lots of goodwill…. all gone. Hell, there was more than one HP employee that had liked the page, including the former Product Manager for the Microserver G7 who was promoted to the DL385 range after a very successful initial model. A. Only authorized representatives may administer a Page for a brand, entity (place or organization), or public figure. B. Any user may create a Page to express support for or interest in a brand, entity (place or organization), or public figure, provided that it is not likely to be confused with an official Page or violate someone’s rights. Well, maybe it was because it was only called HP Microservers rather than HP Microservers Users Group or Fans of HP Microservers. Nobody really knows why, but since the page had been up and running for up to two years, with multiple HP Employees on the page and contributing, one has to wonder what took them so long to request Facebook remove it. You only need to look at the content posted yesterday, including my posts about HP Proliant G8 Microservers leaked and EXCLUSIVE: USB3 is confirmed on Microserver G8, notwithstanding other information on the Facebook page itself. Added to the leak by yesterday, where they stated it was going to be styled in the same design as the other HP Gen 8 servers, we decided to go looking and found that a HP Employee had posted a photo of the new Microserver G8 on Twitter with it’s other Gen 8 relatives. That’s right, it was freely posted by a HP employee. We of course grabbed it and used it – because if an HP employee puts it out there, it’s public knowledge and any ‘posts are my own view and not of my employer’ disclaimer be damned. The really puzzling thing is that we previously removed information about the G8 model back in April when some eagle-eyed Microsavants (that’s a Microserver nut to the average person) found details of accessories for the upcoming G8 models on HP’s website itself! All this info went onto various forums around the world and is still available, however I was asked to remove it from the Facebook page. I elected to comply with that request at the time as a gesture of good faith to HP, and try to forge some sort of partnership with them. There is of course more to this story, and as it plays out I will be posting more details. However there is a time and place for everything, and now is not the time to be discussing those points. It is such a shame to see the wealth of information and links to cool Microserver implementations like putting one in the back of a Dodge Viper is now lost. The membership I am sure will be upset by this as well. Most of them really like the G8 model information, and most were talking about buying one, two or even more. It would seem that once again, a big corporate has literally stomped on the head of an social community that loves its products. Seems counter-intuitive to me. Hopefully HP will see some sense in the next 24 hours and ask Facebook to reinstate the page, if that is even possible. Stay tuned people, a Microserver community on Facebook will be back.